Today, I am sharing an experience where Baba shows His helping and loving nature towards His devotee. Anonymous Devotee from India says: As I write, I think how I can describe how Baba is with us all the time. Sometime we realize it and sometimes we don’t. If we observe then we realize what we feel we are doing actually that all is His work not our actions. He is the doer. I have experienced Baba’s help and blessing and pray that we all become fortunate enough to experience it in our future as well. Today, I am going to share some small incident in my daily life, which shows about Baba’s presence. I have braces and every month I have to go to hospital to get the wire changed. This month I had appointment on 17th march after that the doctor had to go on leave. On 17th the whole day passed as usual and I forgot that I had appointment. When I realized, I knew, it was too late because when he (doctor) will come I will be out of station and my treatment will be delayed. So on 18 afternoon, when my mom told me I had forgotten, I went directly to Baba and asked please Baba delay his holiday by 2-3 days, I don’t want any interruption in my treatment and otherwise it will be delayed. On 19th, my mom called his assistant and she got to know he is in station only because of Baba’s mercy my treatment was not delayed though this event is very small as compared to the big problem. But Baba is very merciful and He fulfills our smallest wish. Thank You Parmatma my Sai. Few days ago I had a very bad dream. I saw many bad souls are going to hold me and calling my mom. I was so frightened. Even my mom couldn’t help me, then I uttered Sai and as soon as I called Baba, my dream broke. Baba also came to my rescue in my dreams. Sometimes, I fear I may become egoistic and forget Baba, but I know Baba will always keep me near Him. Today, I was not able to find confirmation letter of my admission and my all important documents, my PAN, driving license, which were in an envelope and my brother was not able to find his wallet. I was worried couple of days before my brother was cleaning up the study and he had thrown lots of paper. I feared he had thrown my letter as well as the envelope that contained my ID cards. I asked Baba please help us. I was searching for my things and my brother for his ID. I didn’t tell him that even I had lost my things. After searching for some time, my mom asked him have you seen (mine stuff). He said he has kept that safely above the cupboard and soon my brother had also found his wallet. Earlier the same day in the morning, my dad was not able to find the original accommodation letter of our house. We searched literally everywhere. Then again Baba helped us as soon as I asked Baba to help us at the very same moment we found it. My parents say that I should not ask for such small things from Baba. He has greater things to do and greater problems to look after. But I have my own opinion that if I don’t ask my Baba then who else will I ask. Please tell me if I am wrong. I need your help. Lately, I became so busy in other things that I didn’t use to get time to read your blog though sometimes I felt guilty. But I didn’t take any step. Soon I made a friend, who is also Baba devotee. I started to send him mails of Baba and in this way I started to read the blog again. Now when I think about it, I feel all this was Baba’s way to bring me back on track and remember Him and not forget Him. Thank You Baba. Never ever let me go away from Your pious feet. 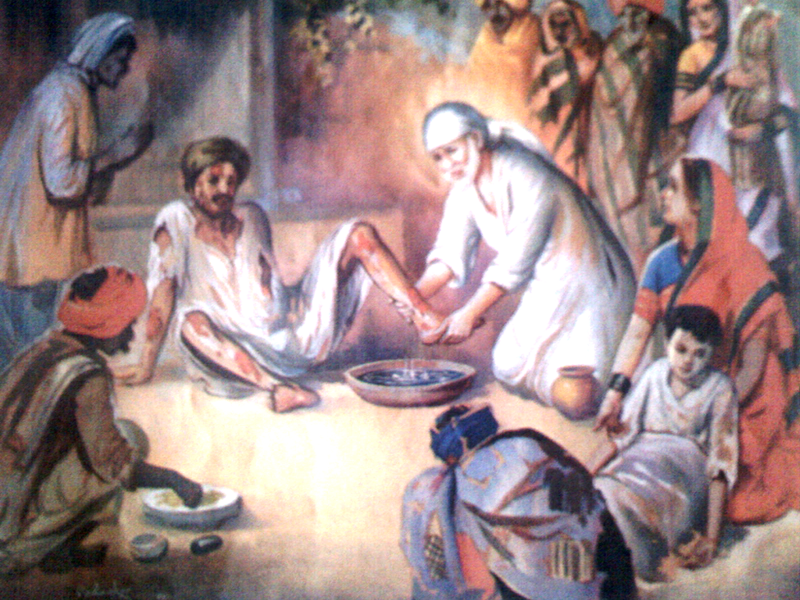 Bolo Jai Shri Sai Ram Ki. Baba is like our mother, if we cannot ask him who else can we ask? as per my opinion no wrong in asking even smallest things, and he knows very well what is good and best for us and he will take care of the rest. You are a blessed devotee. Nice to know that BABA is always beside you. I have also lost my Jwell box containg 3 pairs of gold earrings. I too believe that BABA will get it back for me. 2 years back i lost a gold chain. I am still waiting for his Karuna to get it back. Its all my hard earned money. SAI, i will be happy if i can get it back. This will happen only if you wish. We love you a lot Baba. Please take away all my worries and bad dreams. Fill our hearts will peaceand love. Make us do good deeds always and bless us to deserve your grace. I also call Baba for each and every little things. Let it be my problems or happy moments. I don't feel bad in disturbing Sai in each moment of my life, instead I love to call him because it makes me feel secure and gives me assurance that Sai is always with me. I hope Sai also likes it when I call him. I love him more than myself. Dear devotee their is no wrong at all to seek baba help even if it is very small wish or help because he is our lovely guru and lovely father tool he is our only life and faithfull god. Today even i had small experience with baba i had been to shirdi two months back their i got three baba photos which i fell in love with that and purchased. Got it home and kept it one place today i remebered about those photos i could dint recollect myself where i kept those photos i searched a lot everywer i was almost into tears i just asked baba please baba show me those photos where it is you know where i kept with in second he took me near to my cuboard in that in one small purse i kept ifelt very happy. If you think of baba within a second he will appear infront of you such lovely god baba.we should do his seva forever and we should take care of baba nicely he always works hard for our happiness throught life. I have a question for all of you..plz do reply everyone..
Today i.e around 3-4 am I saw a dream in which I saw SATYA SAI BABA.. I don't remember anything about the dream..the only thing I remember is he was holding my hand and he was taking me somewhere..and he told me that I will secure an ALL INDIA RANK below 385 in exam.. I have given only one exam i.e. AIEEE on 29th April 2012 and the result will come around 14th june.. This exam will only decide my future..
From last few months I was mentally disturbed due to some personal reason and since then I have become a devotee of our beloved SHRI SHIRDI SAI BABA..I never pray to SATYA SAI BABA..
Due to the mental stress I have gone through in last few months, it has badly affected my studies.. I have already got negative result in my 12th board exams.. But now the main result AIEEE is left.. I am hoping for a good result..but getting an All India Rank below 385 is very difficult.. I can expect AIR below 3000.. I am even doing 9 guruvar Sai Vrat and saptah parayan of Sai Satcharitra for my AIEEE result.. I have read Sai devotees experience that SAI BABA came in their dreams and assured them that they will get good results in their exams.. I want to ask all The devotees that the dream I got last night is it a sign shown by SAI BABA that I will secure good rank and will get my dream college or it was just a mere/normal dream as all day,every single moment I pray to Sai Baba for a good result..and as scientists have proved that what we think every time all through the day comes in our dream? Plz Sai devotee help me and answer me? What does my dream signify? Plz Sai devotees reply to my above comment.. I desperately want the answer to my ques..
Hetal ji Plz if you can answer my ques then do reply..! OM SAI RAM....could anybody please tell me about the prayers of devotees taken to Shirdi.Once the prayers are taken to the samadhi Mandir after that where are they left. i am sure they cant be left there. so please guide me as i would like to take the prayers of devotees to Shirdi in mid june.PLEASSSSSSSSSSSSSSSSSSSSSSSSSSSSSSSSSSSSE guide me. Its urgent.May BABA bless us all. I have one divine experience which I have not noticed at that time when it happened..I was having some health problem and was praying baba to cure that....to my ignorance I have met baba but I haven't realised him even though I had a doubt that he is the one who came to me. Forgive me baba please forgive me. Here I go with my experience, one fine day I don't remember what was the day, whether thursday or not I was going to my office by walk. To reach my office I have to get down at one bus stop and have to walk for 5 min to reach my office. Since the road will be very busy at all the times, I was walking fast to cross the road. On the way one very old aged person might be of 85 years age wearing a white Kurta and paijama, a white topi with cloth exactly as baba was taking one basket full of Sapota(cheeku)in a cycle. He came just opposite to me and asked only me to buy/take Sapota from him. Since I was going to office and was in a hurry I felt not to buy Sapota and gave 8-9 one rupee coins to him as a concern. Then I got some doubt that it should be baba by seeing his pleasant, smiling and neat face, but to my bad luck I couldn't realise at that moment. Even he stopped and looked back and was calling me to take Sapota by showing it in his hand. By baba's grace my ill health cured in a 2 months period but I felt If I would have taken and eaten that Sapota from the hands of baba my ill-health would have cured by that time itself. It's all he who does these type of miracles. When ever I remember that incident, I feel bad for not realising at that moment.Please forgive me and give me your nijaroopa darshan again and call me for shirdi which I am waiting from so long. you call out to Baba for every small thing-- the very same question I had asked several years ago to my mom, when she was making kheer.. I 'd told her... 'for small small things you shouldn't trouble Baba..' But now in everyday life I am always remembering and entreating Him for small things also. If we remember him and His nam eon our tongue- is always good. Baba has also shown lost things to me- jewellery and most precious thing -the Sai Amritavani book originally sent by Sri. V.K. Bassi three years ago- recently I got it back unexpectedly from my Travel Bag. I was chanting Sain amritavani- for last one year from a paper copy printed out from the relevant site. Baba was kind enough to show me the original book - with color printed cover page and which is very handy also. Thank u Baba! As for the student devotee who is expecting results of AIEEE results .. I have only one thing to say--- Shirdy Sai and Parhty Sai(Sathya Sai) are one only. Sai comes in dream only if HE wishes.. Many Sathya Sai Devotees have also clarified this. May Baba bless you with good results..
Dear Sai Devotee, I am like you, always talking to BABA when I am alone and thinking of HIM all the time. There is nothing wrong in asking for help or guidance from HIM. I am amazed to see how small and big issues are taken care of BABA when I can see that the matter could have gone worse! Thinking positively about our day shaping up as per BABA's wish and "seeing" wonders around us with amazement how BABA has created this WORLD, keeps you happy and cheerful. As an example what I mean by "seeing" wonders around us with amazement how BABA has created this WORLD. The other day I was a bit early at job so decided to sit in the car instead of waiting outside the store door! It gave me a unique chance to see something very interesting! A birdie would fly just a feet above the ground and I was following it's movements with my eyes ,...wondering why this bird flies so low! and than I noticed it was catching a flying tiny butterfly for it's own consumption!...whoooop! and the butterfly is gone! This continued several time and I was really impressed with the birdies excellent capacity to SEE and catch the flying butterfly! amazing! It was really very similar the way fish would catch it's prey while swimming in the waters..., here the birdie was almost swimming in the air and with lightning speed grabbing that flying butterfly! It is amazing even to imagine, that the birdie could locate the flying butterfly at a far distance and could exactly manipulate where it can be caught on it's flying path with birdie's tiny beak! and I saw it almost 10-15 times this same pattern going on and without fail the birdie had a wonderful breakfast! Baba only comes in our dream if he wishes. So have faith in the dream and you will get good marks.Jai Sai Ram. Dear bro you r lucky, God Bless U. Jai Sai Ram. Frankly speaking, I am not a Satya Sai devotee, but I never complained anything against Him till today. I told our Shirdi BABA, unless He gives me clear indication, I won't accept Him as His incarnation. But anyway, you are lucky to get Him in your dream. He is the who chooses His devotees. I would suggest, wait for the results, if you get a rank below 385 (which is very unlikely-as per your mail), you must accept everything that you saw in your dream as TRUE. That indirectly means, you should start praying Parthi-baba seriously. If not, rank > 385 (which I won't wish to happen), don't pay much attention to our dream, move ahead. I am excited to know your results, please let's know your rank. May BABA show you a wonderful career path ahead. let me tell you something, yesterday when i woke up.. The first thought that came in my mind was how I saw Satya Sai Baba in my dream.. I had never ever prayed to him..though I know SHIRDI SAI BABA and SATYA SAI BABA are one..
As I am tensed for my AIEEE results, so all time I pray to SHIRDI SAI BABA..even we don't have any SATYA SAI BABA'S photo at our place.. So it can't happen that I saw SATYA SAI BABA in my dream because all time I pray to him or see his photo all time (scientific reason declined)..
Now as I have heard that SAI BABA comes to the dream only when he wishes to do that..I feel BABA is indicating me that I will get good rank not 385 but good enough to get my dream college i.e NIT.. I will for sure post BABA'S miracle as soon as my result comes..
Baba plz bless me with my dream college.. Very nice experiences! Don't worry, you can ask Baba anything. He is the best friend of all of creatures, and we should keep him as a close friend and advisor at all times (for small things and big things). It is good that Baba kept your doctor from going on holiday so your treatment wasn't delayed and also helped rescue you in the dream (it means Baba is always there with you to help save you when evil things try to overtake you, Baba will pull you away from them). OM SAI RAM! I would like to share my experience happened today. I had to mail one of my portrait and since I finished the painting 3-4 weeks ago, and I was running out of time as painting must be reached there before 8th of June. I was in the process of getting right size packing box and I was not finding anywhere. At last I thought I will use the large card-board and make a box on my own. Still as a last dash, I went to a furniture store's back side where they discard the packing of the furniture-goods they have received. I requested the employee working back there if he can spare one box for my 24" x 20" painting. And LO! right there on the huge plastic garbage bag where they had collected packing material to throw away, there was a just the right size box that was used to pack mirror and he gave that to me. I got not only the box but also the precise thermocole packing material also which would be utmost useful securing my painting in the box. I mailed the painting with a very professional touch of packing too! Is this possible if BABA has not helped me!?!? I love to see such small help receiving with BABA's mercy.